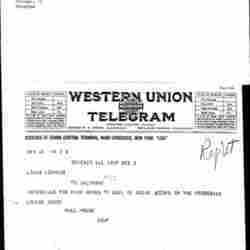 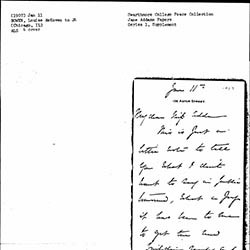 Creator is exactly "Bowen, Louise DeKoven"
Bowen sends word that Addams will not be able to join the Ford Peace Ship expedition. 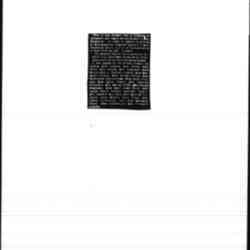 On behalf of Jane Addams, who is away from Hull-House, Bowen sends Blaine a letter from Edward Devine and asks for her attention to it. 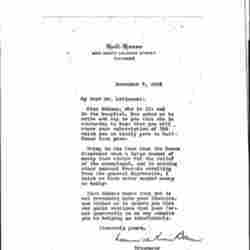 Smith thanks McCormick for the check on behalf of Bowen and Addams. 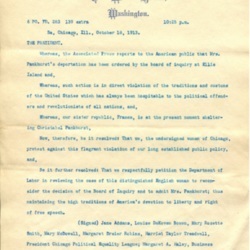 Addams and forty-five other women petition Wilson to halt the deportation of Emmeline Pankhurst. 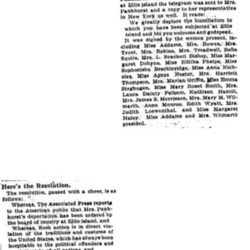 Addams and other Chicago women send a message to Emmeline Pankhurst in solidarity with her, appalled at her detention at Ellis Island. 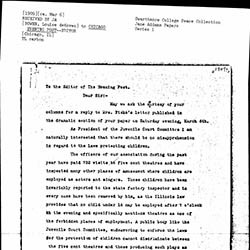 Louise deKoven Bowen presented the report of the Children's Committee of the National Conference on Charities and Correction for Jane Addams, discussing the lives of children in tenements and proposing more resources for recreation for them. 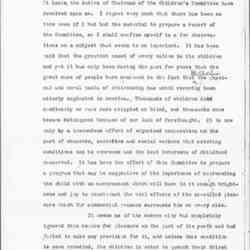 The speech was given during a session on Children held on May 23. 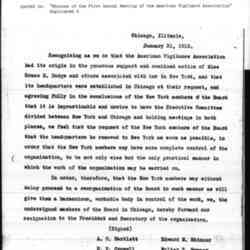 Addams and other members of the American Vigilance Association resign so that the organization's headquarters can relocate to New York. 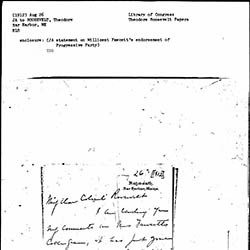 Addams writes Roosevelt that she is sending him her comments on Millicent Fawcett's endorsement of the Progressive Party. 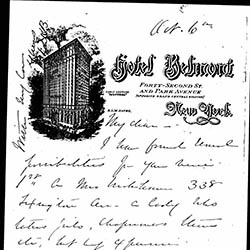 Addams writes Beck about a series of articles the Central Press Association commissioned from her. 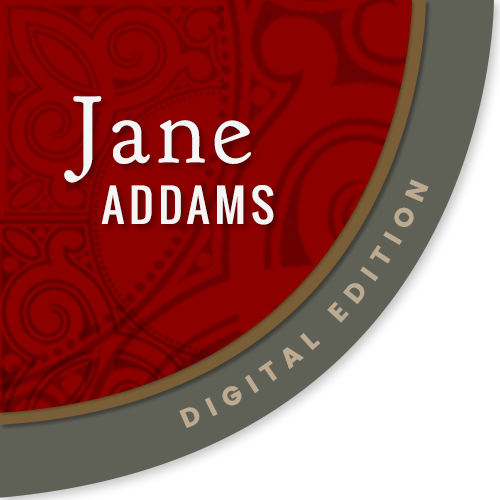 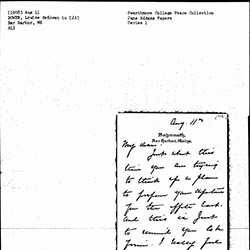 Bowen informs Eastman that she will make certain Jane Addams gets her letter upon her return from New York. 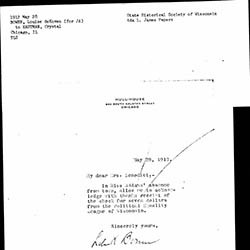 On behalf of Jane Addams, Bowen acknowledges Eastman's receipt, sent to Addams for a hotel bill in Milwaukee. 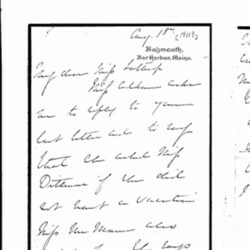 On behalf of Jane Addams, Bowen writes to Lathrop about vacations for Hull-House residents. 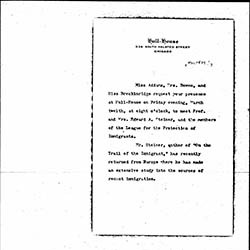 Addams, Bowen, and Breckinridge invite an unknown person to Hull-House for a meeting of professors and the League for the Protection of Immigrants. 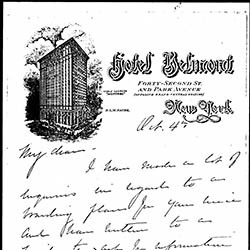 Bowen sends Addams a list of possible housing options for Marcet Haldeman. 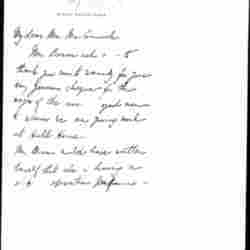 Bowen encourages Addams to come as planned to Maine because she needs the rest. 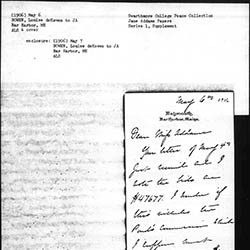 Bowen tells Addams she wants to donate money to build a place for boys. 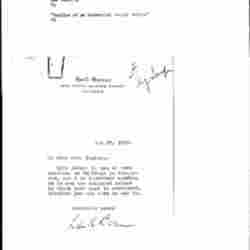 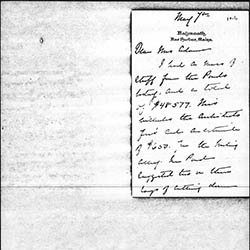 Bowen encloses a letter from Helen Culver and offers to fund the construction of a new building. 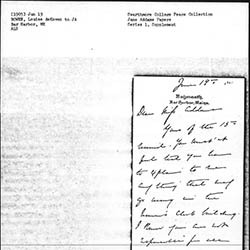 Bowen writes to Jane about dealings with Pond & Pond Architecture. 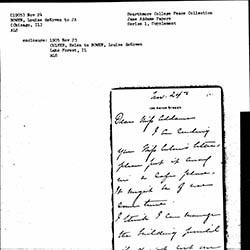 Bowen writes to Addams about dealings with Pond & Pond Architecture and the Hull-House buildings. 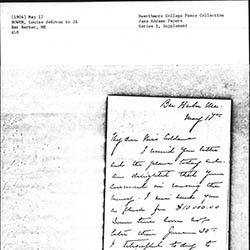 Bowen inquires about how donations to Hull-House are used and asks for a budget for its needs. 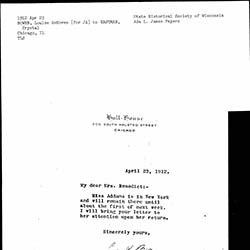 Bowen discusses relations between Hull-House and the Women's Club. 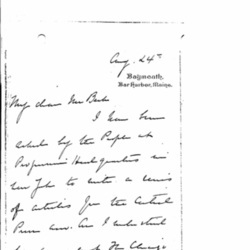 She also mentions allowing Laura Pelham to stay in Hull-House and offers to pay her rent. 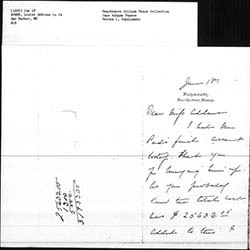 Bowen gives an accounting of the costs of the new hall at Hull-House and comments that the cost was lower than anticipated.